Licole camera support monopod heads are specially designed for the wildlife photographer using medium to very large telephoto lenses. Only when the photographer has a comfortable balanced stance can the monopod be used to its full potential. If you have to crouch or bend to see the viewfinder for high subjects or get up on the balls of your feet for low subjects then the monopod is not providing a stable support. Licole Monopod Heads enable the height of the camera to be adjusted with one hand easily & quietly & held firmly at any desired height. If you never use IS then a monopod is not for you. Photos shown with an asterisks in the Gallery have been taken with a monopod. Licole make 3 types of Monopod. All feature a vertically travelling camera mount that counterbalances the weight of the camera allowing adjustment of the camera height. Camera height adjustment is a smooth & easy one hand operation. When the camera is at the desired height it remains steady in this position irrespective of hand pressure from manual focusing, shutter release or additional weight of flash or light for night shooting. All types provide counterbalanced vertical travel for camera+lens+flash combinations with mass of 2.5 to 7.5kg. The locking friction is proportional to the camera assembly mass. ﻿Series 1﻿ Monopods are a fixed length carbon fibre monopod with an integrated head & track system. These are made from narrow section carbon fibre sailboard mast tips, so are light but very stiff & robust. The integrated head gives counterbalanced camera travel height of 400mm. This monopod assembly is a no-compromise solution for expedition shooting with big telephotos & especially for night shooting with the added weight of flash & lights. It is most conveniently carried in a roof rack tube for expedition shooting. Series 2 Monopod Heads are specially for use with Gitzo Tripod GT3541XLS. This head fits a leg of this tripod converting it to a monopod with the same features as a Series 1 assembly. It is designed for light weight air travel where you want to take your tripod but will also be shooting in conditions where a monopod will have advantages. Counterbalanced camera vertical adjustment is 300mm. 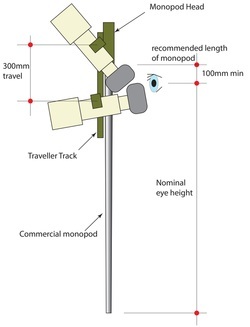 Series 3 Monopod Heads suit any commercial telescopic monopod - see Monopod Selection Criteria. Counterbalanced camera vertical adjustment is 300mm. Long monopods are recommended for all photographer heights. The ground may fall away in front of the photographer or the subject may be overhead. If the full extension is not used then the longer leg overlap will provide greater stiffness. Extended lengths 100mm ( 4in) greater than the eye-height of the photographer are recommended minimums. Few monopods meet this criterion but the Gitzo GM3551 or Really Right Stuff MC34 are the stand-outs. Larger diameter monopods are recommended as they have greater stiffness relative to weight & will be more robust for the case where the tip lodges in a crevice or you lean heavily on them in rough terrain. The stiffer the monopod the less the camera movement. Select the longest collapsed length that you can conveniently pack. These monopods will have less joints, greater leg overlap at joints & they will be stiffer & quicker to extend, & generally more robust.